Our customers love their GRIT Freedom Chairs! Every rider is different, with their own abilities and needs. The best way to see if the GRIT Freedom Chair works for you is to try it. Our 30 day Satisfaction Guarantee lets you try the chair risk-free for a month. “When I got my GRIT Freedom Chair in the mail, I expected it to be a fun chair that would allow me to do more things. I didn’t expect that it would change my quality of life so much. I have done things I would never have been able to do in my standard chair. 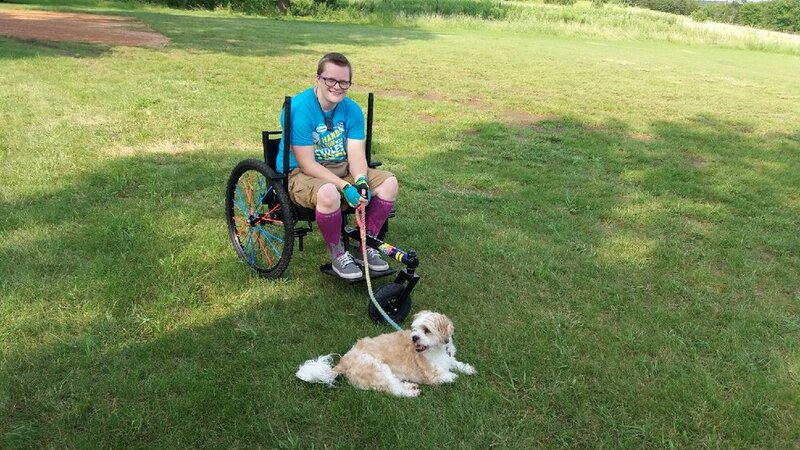 I got to go to my local Pride Festival last weekend with my friends, thanks to my Freedom Chair! We went on dirt, grass, over curbs, and up steep hills which would not have been possible without my Freedom Chair. I have had the opportunity to take my service dog for fun walks all over town again. Because of my Freedom Chair, we can now go to the pond behind my mom’s house again! The path around it has grass, dirt, and wood chips and I couldn’t go around the pond anymore because of my disability. Now I can again and I’m so thrilled! “I have an adult daughter with CP. We don't have a lift van and we were looking for a chair we could transport and didn't need someone to push. I somehow came across the GRIT Freedom Chair on Facebook. After much discussion she decided to give it a try. (Thank you payment plan!) I couldn't believe how quickly it came. This chair has made a world of difference to her. Since it is winter we haven't had much opportunity to use it outdoors but are trying to use it as her main transportation as much as possible. We can finally shop together and I can push a cart instead of her! She can shop on her own without me. “The GRIT Freedom Chair is an amazing piece of equipment. I have done 5Ks in the chair and I love it. It does take some getting used to and I am still trying to get used to the ins and outs of the chair so I can use it to its full potential. It is expensive, but when you are talking mobility, it is totally worth the investment. I love that the wraps for the lever handles come in different colors so you can customize to your own sense of style. You will definitely get a workout just using this chair. To me, this is my luxury vehicle that allows me to have the potential to do the things I want to do and stay as active as I can. If you are looking for ways to fund the chair, start a GoFundMe, apply for grants, do whatever it takes, you won't regret it. You will wonder how you ever made it this long without the Freedom Chair. "The Freedom Chair made all the difference at the Grand Canyon National Park. Paved paths, gravel paths, or no predefined path. Where others went, I did also." “My Freedom Chair is very helpful. I agonized on spending the money for several months after reading about it on one of the news outlets. I was concerned I wouldn’t get the use out of it I had hoped for. I expected to use it for walking our dog, works great for that. Doing the lake walk, yup, going on some of the woodland trails, not yet, want to try and get to some of the local water falls, not yet. But never thought about, the dog park, beach, Bentleyville Christmas Light Display. Would have never gone with out the FC. Tried some of these things with less than satisfying results in other mobility aids. Some other things not possible with my other mobility aids, (standard wheel chair, power chair and a cane) are possible with the Freedom Chair. You may wonder why. Below zero temperatures. Power chair is not usable, snow, several inches, freezing rain make everything dangerous. I can get the mail, haul the garbage, walk the dog, take pictures of the beautiful moon in our clear blue skies and the options list continues to grow. “I have used a TiLite lightweight manual wheelchair for about 7 years now, and my biggest problem was how easy it was for that chair to catch on unevenness in the pavement when I was outside, and also it was very tiring to use the chair because a traditional manual chair uses very few, small muscles to propel. I'm thrilled with my Freedom Chair because now I can easily maneuver around outside, without getting caught up on gaps in the sidewalk. Moreover, now I can safely ride my chair on surfaces like dirt trails or tracks, grass, and other outdoor surfaces, which was really hard to manage in my traditional chair. The lever action takes a little getting used to, but because it uses more and larger muscles, it's not as tiring to use my chair, and it's even good exercise! At first, I was unsure if the Freedom Chair was going to work for me. I have fibromyalgia and neuropathy, and initially, it was hard to push myself around, especially on ground that was a bit of an incline. It was also challenging to figure out the best way to get the chair into and out of my car. However, each time that I use the chair, it gets easier. Most importantly, I'm no longer stuck inside--it's a delight to take my Freedom Chair to the park and ride around outside. Every time I use my Freedom Chair I get a little boost of happiness from the exercise and from being outside. “The Freedom Chair gave me such a sense of joy when i had put it together (good instructions!) and gone around the driveway a few times and took it down to the bike path by the river. I wasn't even aware how constrained I had been til i felt the breeze on my face and the sense of self-powered freedom in being able to set my own pace and direction. It took me some practice to fine tune my ability and tweak the seat cushions to suit me, but it has opened up a whole new freedom for me. I look forward to getting stronger and better able to explore in it. I was surprised how quickly I got over being self conscious at meeting runners, walkers, bikers. I so enjoyed hanging my old bike basket on the back, putting my water bottle in there, and taking off. “I have used my Freedom Chair almost every day since I have received and assembled it. Being a retired engineer, I appreciate the quality design and workmanship in the chair. We just returned from a family vacation in the Blue Ridge mountains near Asheville, NC and the chair let me enjoy the many hiking trails in that area. I also use it in my daily life here in South Florida. “The Freedom Chair is a excellent piece of equipment to get you in the outdoors on trails and various types of terrain. it is even great for everyday use! “I've lived in my current house for 15 years, and I've never been able to roam around the grassy, park-like area behind our property--until this year, thanks to the GRIT Freedom Chair! Now I'm no longer the only one in our neighborhood excluded from exploring this beautiful oasis! Freedom, indeed!" “Loving this chair!!! Learning the how far I can push myself is almost as rewarding as the sights, sounds and smells of a forest that has yet to encounter very many humans. “This is an awesome off-road wheelchair that has opened up my world immensely. Not only can I easily navigate dirt roads, mud, lawns, snow and ice, but I am now able to get to many more places in nature that I was no longer able to get to. When I got my first manual wheelchair 4 years ago due to MS, the mobility specialists told me I was unusual...that most people with MS usually just get a motorized scooter. My philosophy is that I will stagger, crawl, or propel myself with my arms as long as possible. Before getting the Freedom chair, I had developed chronic shoulder pain, as I've lost grip strength bilaterally, so had to twist my arms in unusual ways to keep pushing the manual chair. After switching exclusively to the Freedom chair, my shoulder pain has completely disappeared. The lever system is awesome, and if worse comes to worse, I can Velcro my hands to the levers, even if I can't grip a manual wheelchair rim. It is pricey, but when you compare it to the price of manual wheelchairs, it is extremely well-built and actually very well-priced in comparison. Also, the fact that they have used common bicycle components, it's very easy to repair, and can be done by any bike mechanic. I'm no longer reliant on mobility specialists who make you wait months to repair, and then charge insurance 10-20x the amount. “This thing has changed my life! After years of being dependent on others to leave my house I can now roll out of my front door under my own power! What a feeling! I met (for the first time) a neighbor who has since become a friend, I've gone shopping at the market two blocks from my house, and I discovered a grove of trees by a creek where I go to read. Clearly things have changed for me! Kudos to the little elves from MIT who created the no frills yet elegant design of the Freedom Chair. It's a cross between a wheelchair and a mountain bike, a FAT TIRE WHEELCHAIR, which is what I typed into my browser search line when I wanted something to use on the sands and trails of the southern Utah redrock. As with anything new, a first time rider would do well to apply a little desire and creativity to adapt to smoother operation. Persistence pays off. Since my initial purchase I've accessorized it with the Precision Freewheels and the Steering Foot Pegs which has made it more custom to my needs. It has since become my chair of choice for most daily activities. “An excellent device for getting exercise if you have another device, such as a powered scooter. Also able to go places that other devices can't. I appreciate the speed that can be achieved and the stability of the chair. The ability to breakdown the chair easily is a real asset. We recently traveled with a full van, and being able to quickly disassemble/assemble the rig was a real plus. I can’t even express how much it means to be back out there with him. Going for runs with my husband, that part of my life, was so much a part of how I identified, and when my health took it away from me…..well, let’s just say it was harder than I would have expected. Sending tearful thanks to the lovely people at Grit for giving me the chance to get back out there! This chair (Mark calls it my Hooptie! lol) is not only changing my life - it is a joy to use!! I honestly thought that I would only use it for off-roading…..but it is gradually becoming my 100% of the time chair. We just ordered the city wheels, extra axles and the steering foot pegs yesterday!! I’m ridiculously excited!!! I know I’m kind of gushing…..and I know that I’m “preaching to the choir”….but I just have to say it again - Thank you Grit for an incredible product!!! Thank you Nerissa for posting awesome videos that helped in making the decision to buy in the first place! And thank you Freedom Chair FB Group for being so friendly and welcoming and helpful and fun! "My trail buddy is my trainer, Henry who I have grown so close with. The GRIT Freedom chair has given us a plethora of opportunity of new activities to workout with. We can now take those trails that once weren't accessible. I can now take a stroll with Henry and get a workout while doing so. Thank you Freedom chair! " “This wheelchair is absolutely life-changing. For at least 60 of my 75 years I was an avid Outdoorsman. I backpacked. I kayaked. I fly fished and most of all I bicycled. And then 5 years ago, training for my second triathlon, I was in a very bad bicycle accident. In an instant most of those activities were going. I did replace the biking with swimming just to keep in shape but I could not replace any of the others. Of all of the activities the one that I miss the most was bicycling. For many, many years, most days, I would be outdoors on my bike for an hour or two hours for however long I had that day. And I also did many very long distance rides. 75 miles, a hundred miles, 300 miles in 2 days, etc. I purchased the chair to duplicate my outdoor experience on the bicycle trails. Any other application was a wonderful addition. And so I have been on some very small flat hikes in off-road experiences. But what I have done mostly is get back on my bicycle trails. I am now able to duplicate The Outdoor Experience of an hour or two most days. It is simply wonderful. I like most Riders have my favorite pass that through various Woodland settings. I also occasionally ride at night and have figured out how to equip my chair so that is very visible at night and that I can see the trail ahead of me. I have also entered my first 5k race and I'm proud to say I was the winner in the wheelchair Division and was just seconds behind the third place age group winner. I am currently training for a 6K race to be held in a few weeks. “I've gotten my freedom back! Before my disability I was always outside being active. I haven't been able to walk along the beach with my husband, enjoy some of the local park trails, or get out on the bike trail. Now I can do all of these things and I can do it MYSELF! “We love our Freedom Chair. It actually is made for everyday use and some adventure if you wish. It also has attachments to help other people adventure with you and/or help you in your adventures. Nothing in the other wheelchair companies even come close to being as fun, flexible, and as safe - even the custom ones. Then on top of it all, you can quick release the parts and fit it in almost all trunks - you sacrifice one back seat in the really tiny cars - only because of a custom extra part they added for us. And, get the Freedom Chair tuned up at any bike shop! It has some power assist that helps us with our weak muscles in the bars it has to help get some extra power - great for hills and bumpy stuff like grass - or the rocky areas in AZ like us. “I love the chair! I’ve already been down trails, across the beach, and straight into the water. Definitely a learning curve, but I am learning fast and I look forward to going longer distances and more challenging terrain.